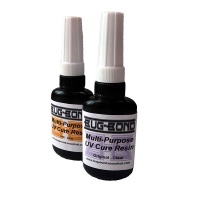 Bug-Bond is a multi-purpose UV Cured Resin which has been put together with the 395nm UV torch in a kit designed primarily for fly tying as an easy to use replacement for epoxy, which can be messy and time consuming. It has been developed for use as a coating and is ideal for coating and doming applications. The optically clear and tack free formulation also makes this product suitable for fly tying, rod building and various other applications. 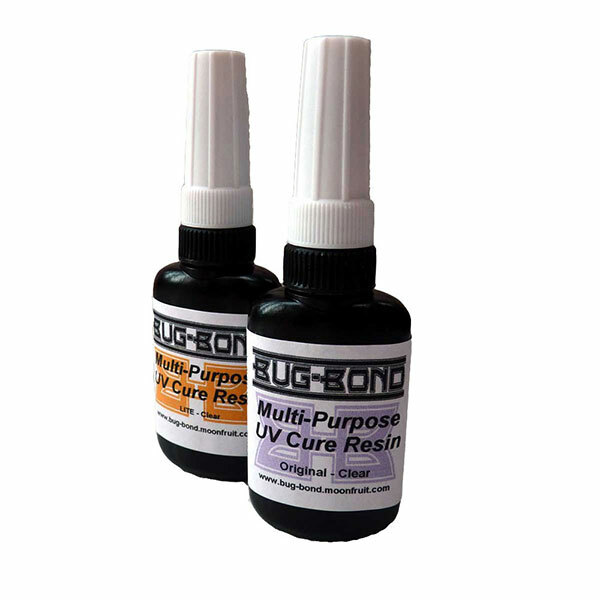 BUG- BOND™ Original is a multi-purpose UV cured resin which has been designed as an easy to use replacement for epoxy. Developed for use as a fine coating or to build up for doming applications. Suitable for tying tiny epoxy buzzers to pike flies. Bug- Bond Lite™ is the choice where no build up is required - ideal for coating stripped quill bodies and all similar applications. Bug-Bond is supplied with an applicator which allows you to apply small amounts and work this with a bodkin or a wooden tooth pick to get the desired effect on the item and then cure...this can take as little as 5 to 10 seconds. Large amounts of resin in saltwater baitfish patterns can take longer to cure BUT not as long or as inconvenient as using a drying wheel if using two part resins. A great feature of Bug Bond is that it will not to yellow on exposure to sunlight... in fact strong sunlight will deepen the cure further.